A few years back I made a vain attempt at making Sega Genesis and SMS AV cables. Although they did work, they didn’t last long because the connectors I used were harvested from MIDI cables and never properly adhered back to the plug. A few good uses later and both sets of cables were rendered dysfunctional or completely useless. 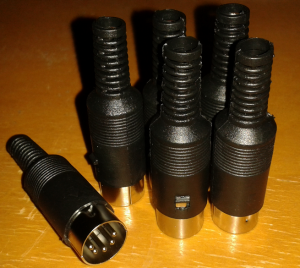 As I hinted at, in the original article, 5 pin DIN connectors are often sold online, and after a short search on Amazon I found a pack of 6 for less than $4 shipped. It took a while to arrive but finally it’s time to make yet another attempt at creating these AV cables. First thing to note is you get what you pay for. 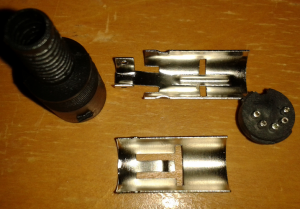 These connectors aren’t of the greatest quality; the part holding the 5 pins melts slightly under even normal soldering conditions and the pins can move forward or backwards slightly. The metal parts and connector seems sturdy enough but the plastic shroud is soft plastic with absolutely no grip whatsoever, which is why I will strongly advise using the strain relief provided on the metal part. These connectors easily disassemble into four parts, allowing for quick and easy soldering while also making the finished product far more secure than the harvested connectors I haphazardly used originally. At first I wasn’t entirely sure how well these would go together, but after the first one they started going together quite well. Something else to note is that I’m just now making them, so I can’t speak on terms of how long these things will last, but assuming you’ve properly soldered all the joints, used good quality AV cables and only hook your console up and leave it in place, these should last for a long time. With the color coded pinout above you should be able to make your own Sega Master System or Genesis model 1 AV cables. Even with my soldering skills being average I managed to put together two sets fairly quickly. I would highly suggest using AV cables with a shielded video cable though. Only one of my sets of AV donor cables had the shielded video side and it makes a big difference. You can make them as long or as short as you need. 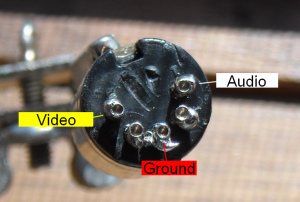 Sadly, to my knowledge, there is no way to get stereo sound from the back output of the Genesis model 1, but if you want to make video only cables and use a 3.5mm to stereo cable in the headphone port on the front of the Genesis model 1, that is differently possible with these plugs as well.